Matt camoflauge comprising three colour pattern, dark green, spring green, bright green. Designed with tournament fisherman in mind, Sunline Shooter Metan Fluorocarbon is one of the most manageable and castable fluorocarbons on the market. Shooter Metan, a premium 100% fluorocarbon line, is gaining acceptance by pros and weekend anglers alike as more and more people experience the union of manageability, strength, and near invisibility that has made this line an instant success. Metan Green alternates between three shades of green to match the color of vegetation your are fishing. 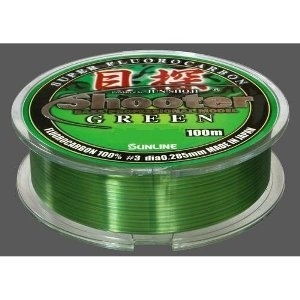 Sunline Shooter Metan Green Fluorocarbon has been specially formulated as a great all-around line, and is available in the mid-range line tests that make it a great choice for cranking, jigs, jerkbaits, topwaters, and much more.